This was Greg's 1970 K/10's final stage. It still had the rebuilt 350 in it, with 30,000 miles on it. and a 4" suspension lift. Sporting American Racing Outlaw II's, 6" lift, and 35" Gumbo Monster Mudders, and lots of other goodies. The problem was rust. The door pillars where the door hinges bolted to were completely rotted. The drivers door dropped a foot when you opened it. It was a tough choice, but Greg knew the truck was done. He knew the drivetrain was strong. 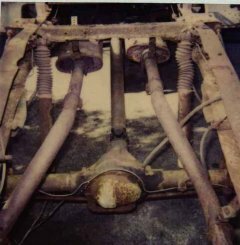 This was a 1970 Chevy K/10 shortbed. 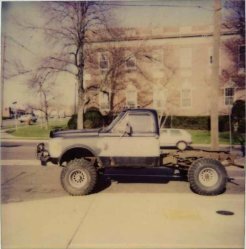 It had a 12 bolt GM posi rear, a Dana 44 front axle, a NP205 transfer case, and a 4 speed Muncie trans. He considered many different body swaps. Since his truck was shot, he needed a daily driver other than his 79 Z/28. He bought the Monte Carlo. He drove it all winter, and in the Spring, we started this project. This was in 1992. the entire project took about 8 months worth of free time. Some days were 6 hours of work. It was worth it, I learned a lot. Here's Greg's 70 K/10. The bed removed already. 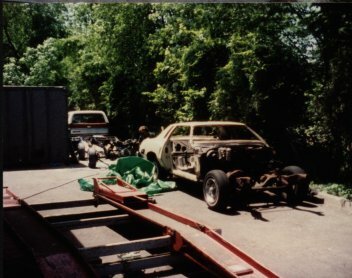 Here's the 77 Monte Carlo with it's nose and doors removed. It's amazing what you can do with a cherry picker and some 2' x 4' s.